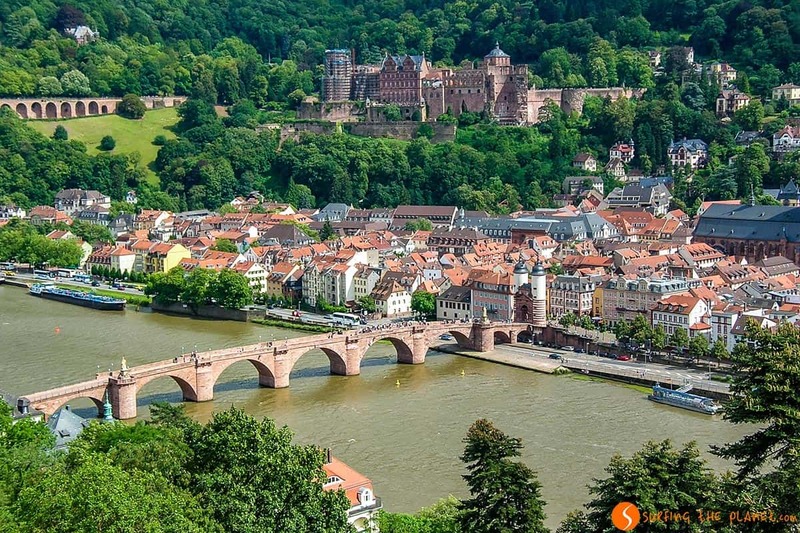 Heidelberg, situated on the banks of the Neckar River is known to be one of the most romantic towns in Germany. While you walk around the essential places to visit in Heidelberg, you constantly bump into sights that seem to have come out of a fairy tale. 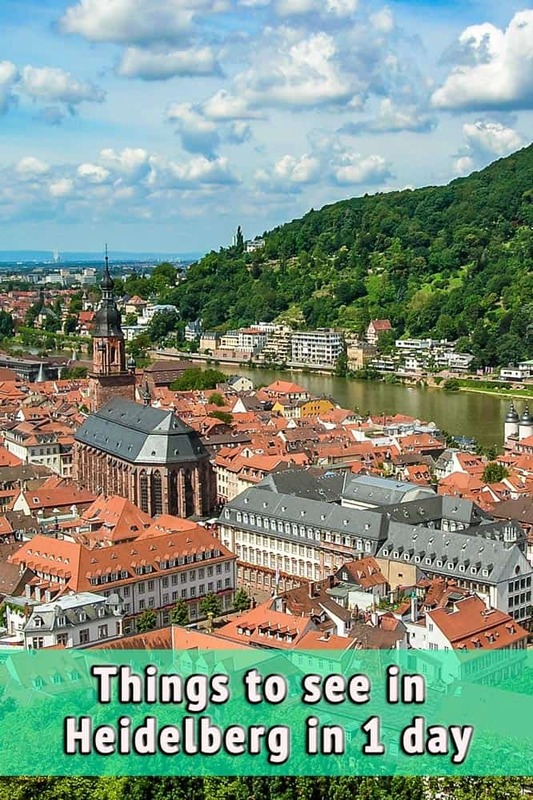 We had the chance to spend a weekend there, and although it’s possible to go through essential things to do in Heidelberg in 1 day, it’s more advisable to dedicate at least a couple of these days to this wonderful town. Heidelberg has a unique ambiance; it’s not surprising that so many famous intellects, philosophers and scientists found inspiration in this place. According to Wikipedia 56 Nobel Laureates have had some connection with the University of Heidelberg, and 9 of them received the Nobel Prize while they were working there. Even nowadays you can feel this classical intellectual atmosphere in town, where on each corner you found something picturesque, but where romantic nostalgia gets mixed with the cheer of those students who keep coming to study in Heidelberg in search of inspiration, just as did those intellects who were reflecting on life’s big questions while looking down on the town from the Philosophers Walk on the hillside. 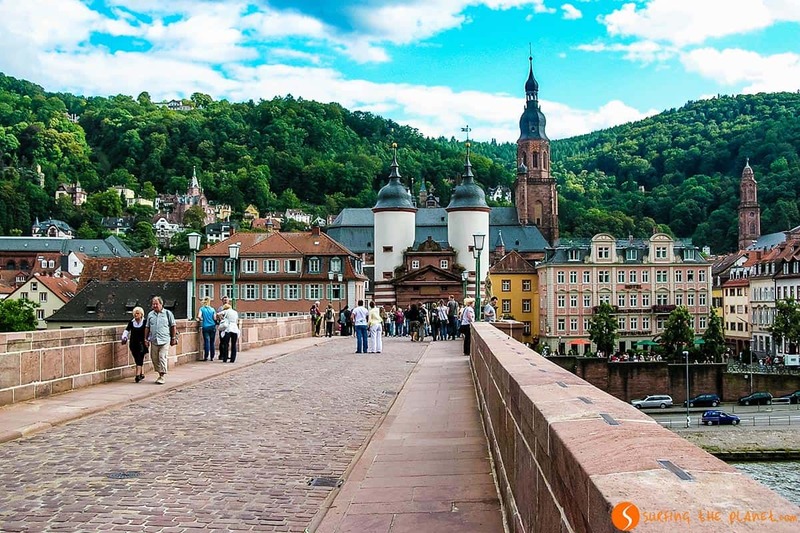 We take you on a romantic stroll and show the Top 10 things to see and do in Heidelberg in 1 day or on a weekend. Without any doubt, the principal monument to visit in Heidelberg is its castle. 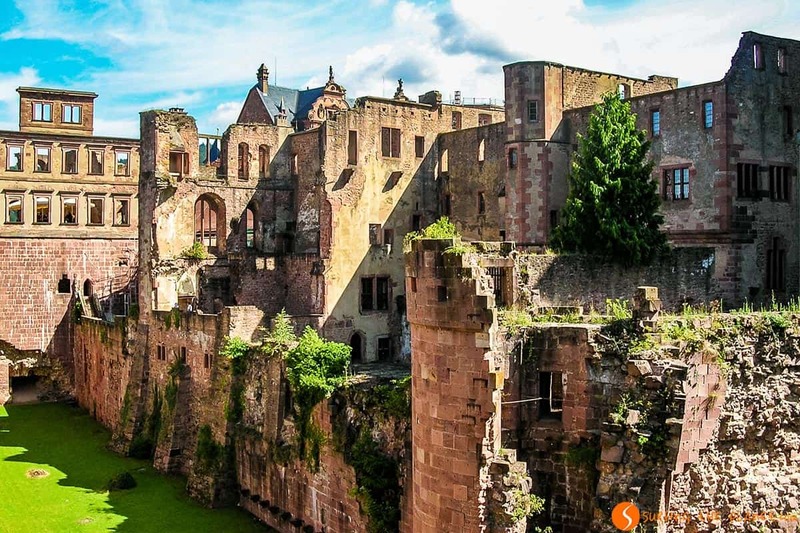 Heidelberg Castle (in ruins) is not only the major historical monument of the town, but it’s also an unusual and mystical castle that, in addition, offers some of the most exceptional views of Heidelberg. The castle was built in the 15th century and was later extended using elements from several different architectural styles. Unfortunately, most of the castle was destroyed in the war against the French in the 19th century. It’s possible to go up to the castle (found on a hilltop) in a funicular or on foot. When you enter the castle through the gate, you arrive at Torturn, the main patio of Heidelberg Castle. Although most of these buildings are in ruin, you can contemplate some of the façades and see this exciting mixture of styles that characterizes the castle. 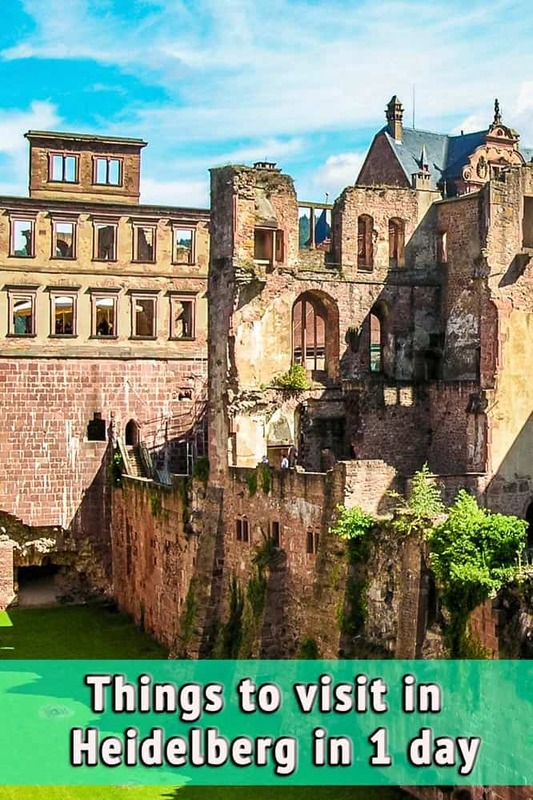 You can visit Friedrischsbaum, a lovely castle built in Renaissance style and from here you can access the terrace with breathtaking view of the most emblematic places of Heidelberg. The Castle also has a winery, where you can taste local wine. 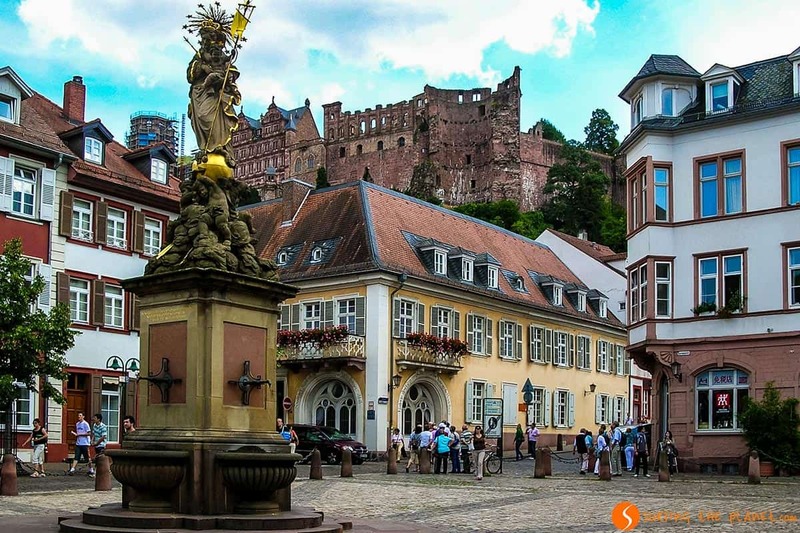 Although this German is most famous of its atmosphere, not the museums you find there, one of the interesting things to do in Heidelberg is to spend some time at the Pharmacy Museum in the interior of Heidelberg Castle. 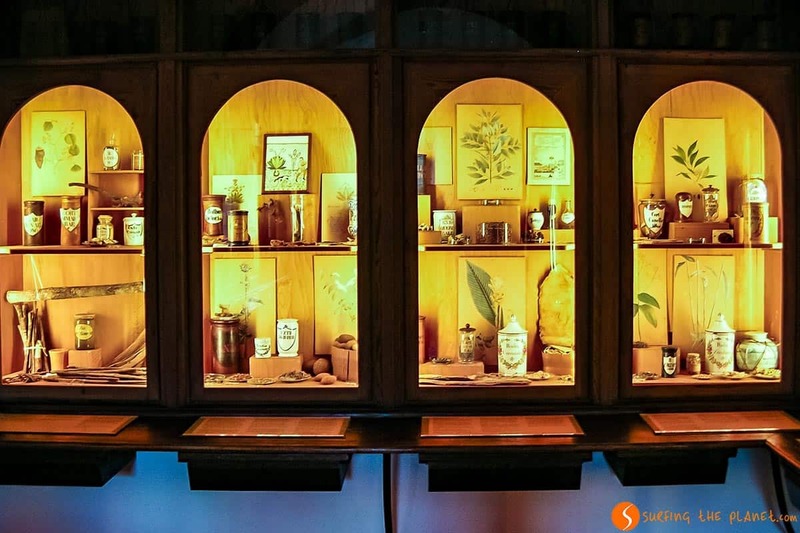 Looking at the original objects, you can imagine how beautiful pharmacies were in the 17th and 18th century. In the museum, you can also learn a lot of interesting stuff about alchemy and the life of pharmacists. 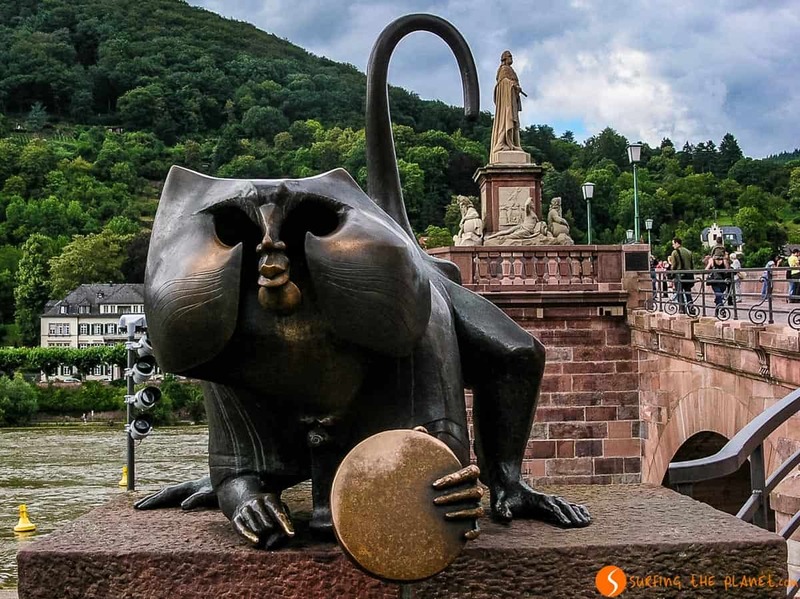 The Karl Theodor Bridge is probably the most picturesque monument to visit in Heidelberg. This bridge that all people refer to as the Old Bridge was built at the end of 18th century during the reign of Karl Theodor who was one of the most successful princes of Bavaria. It’s interesting to know that formerly there had been two other bridges where the actual one stands, but they were both destroyed by floods. That’s why they decided to build a strong stone bridge, which seems to have resisted ever since. The reddish color of the stone used in the bridge can be seen in many other buildings of the town. It’s worth stopping in the middle of the bridge to look up to the castle and also to gaze at the beautiful entrance gate of the Old Town with its white towers. You also can’t leave without finding the funny monkey statue on the bridge. 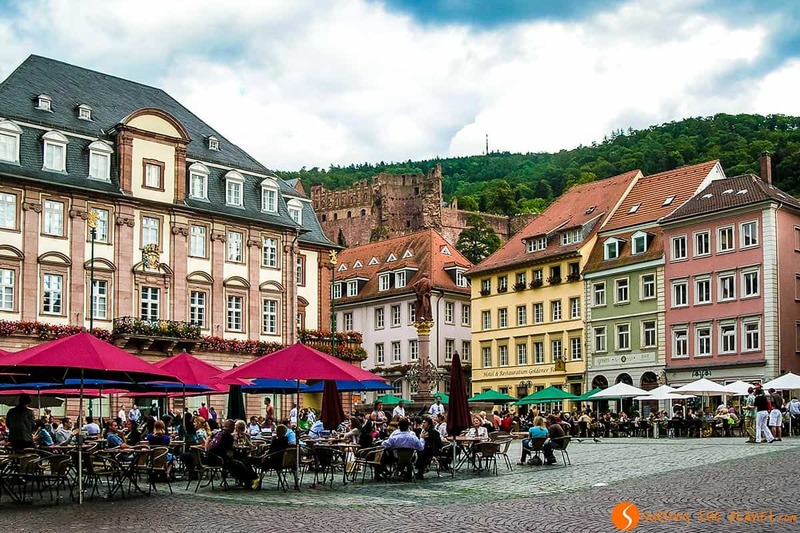 The most important square to visit in Heidelberg is the Market Square (Marktplatz), where the medieval market was held centuries ago. The Church of the Holy Spirit is the most impressive building there, but it’s worth checking out the Town Hall and the Fountain of Hercules at the center of the square. 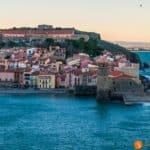 I especially loved the colorful houses around the cheerful atmosphere with a lot of people having a meal or a beer on the restaurant terraces. Haupstrasse, the main street of Heidelberg, goes parallel with the Neckar River. It’s the commercial artery of the town that connects Bismarck Square with Karlstor, a kind of triumphal arch from the 18th century. This street is always busy with both locals and tourists, and you can find street musicians in many places, especially during the weekend. 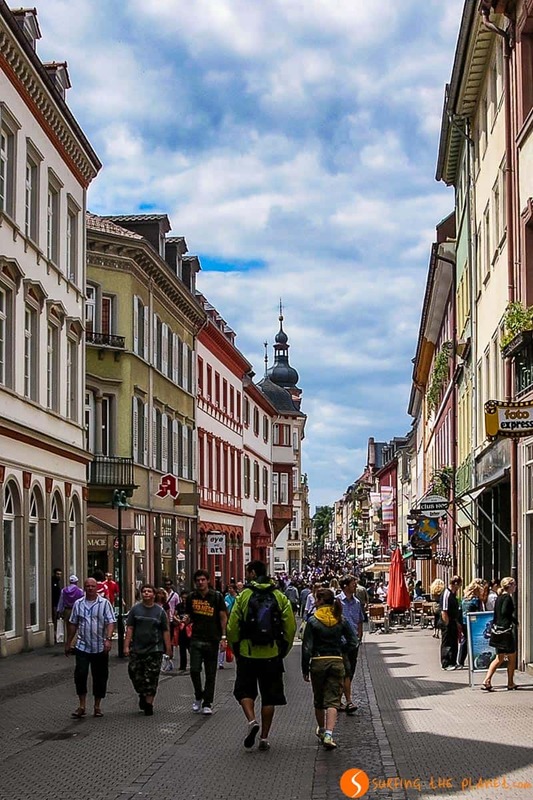 One of the great things to do in Heidelberg is to enjoy the cheerful ambiance of this street. The Old Town of Heidelberg is full of charming old houses, and many of them contains this reddish color that you might have noticed at the Old Bridge. Probably the most impressive of these old houses is the Haus zum Ritter, which has a very elaborated façade. 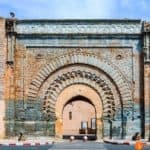 It was built at the end of the 16th century by a French merchant, Charles Bélier. 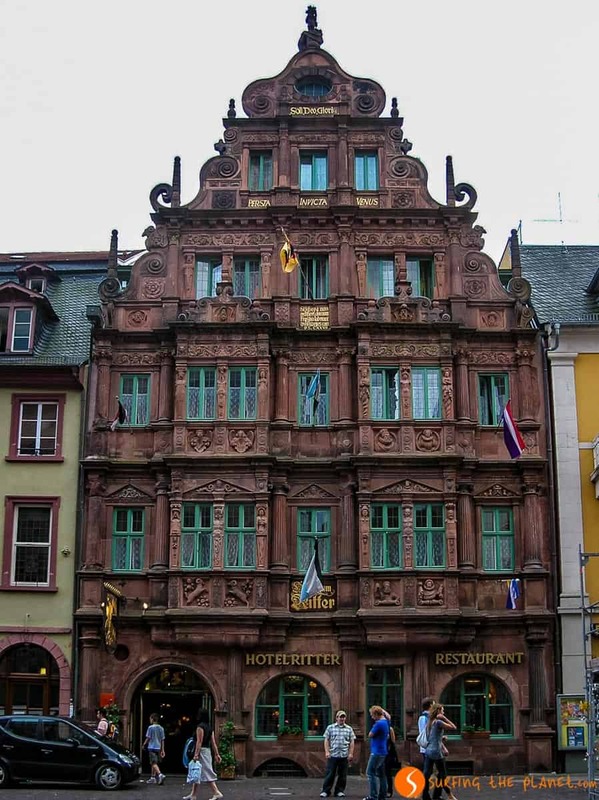 It’s one of the many houses built by prosperous merchants of that time, but unfortunately, that’s the only one which is in its original state, since the others were destroyed during the 9-year war (1688-1697), the same war that devastated Heidelberg Castle, too. Although the Market Square is the most important square in Heidelberg, our favourite was Karlsplatz with a much less touristic vibe than the main square. It’s an idyllic and calm square, which is ideal to have a drink at without a lot of tourists around. There’s also a nice fountain in the middle of the square. Heidelberg Castle can be seen from many places in town. Our favorite view of the castle was from the small square called Kornmarkt (very close to Karlsplatz) with a statue in the middle. No one could summarize better the essence of Heidelberg than Goethe. The German writer wrote: “Heidelberg has got something ideal”. 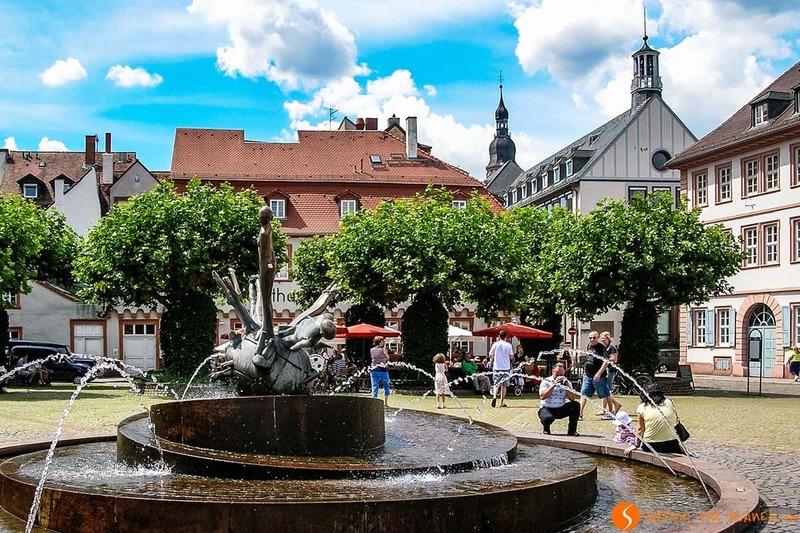 Many other writers like Mark Twain, composers like Schumann, philosophers like Hegel and other individuals of significant historical importance like Martin Luther found inspiration walking around this city. The Philosophers Walk (Philosophenweg) might be the place most strongly associated with this intellectual richness. 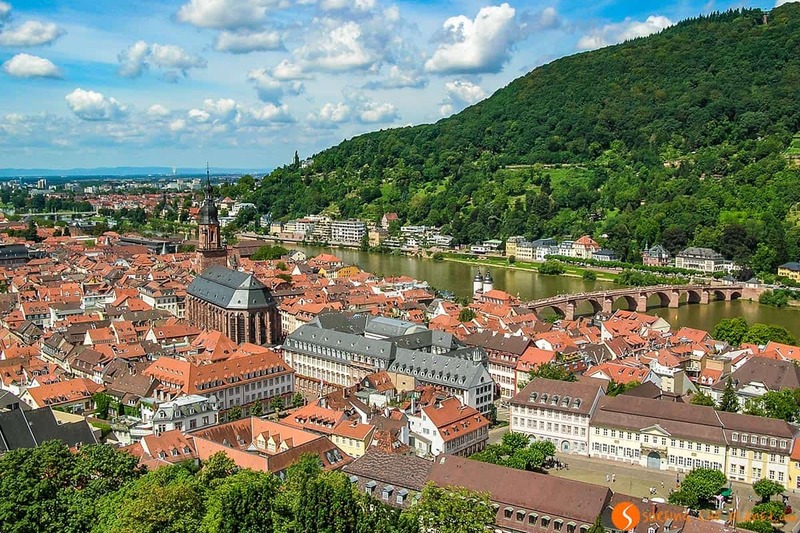 It’s a walking path on the hillside that offers fascinating views of Heidelberg and the whole Old Town. We also felt touched by the beauty of this place, and we didn’t find it surprising that so many people felt inspired there. 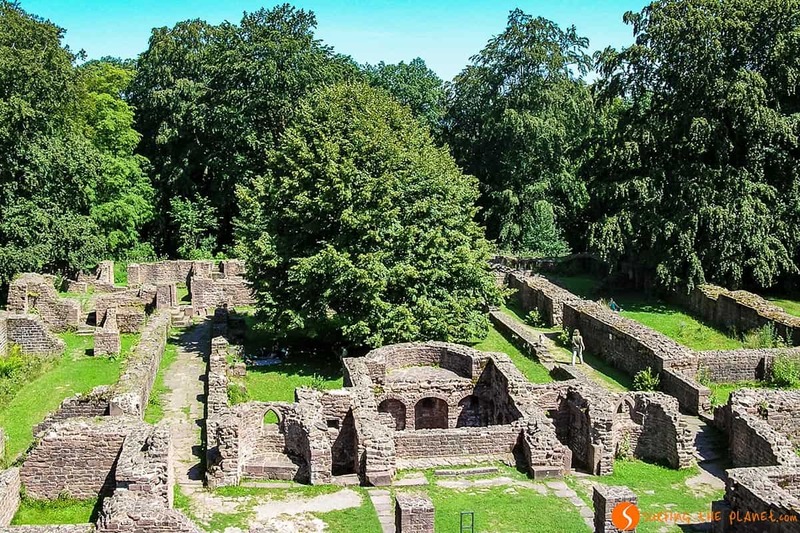 One of the greatest surprises of our trip to Heidelberg was visiting the ruins of St. Michael Monastery. These ruins of a monastery founded by the Celts are found at the top of the same hill where the Philosophers Walk is found. It’s a place really out of sight, and you will not stumble into many tourists there. 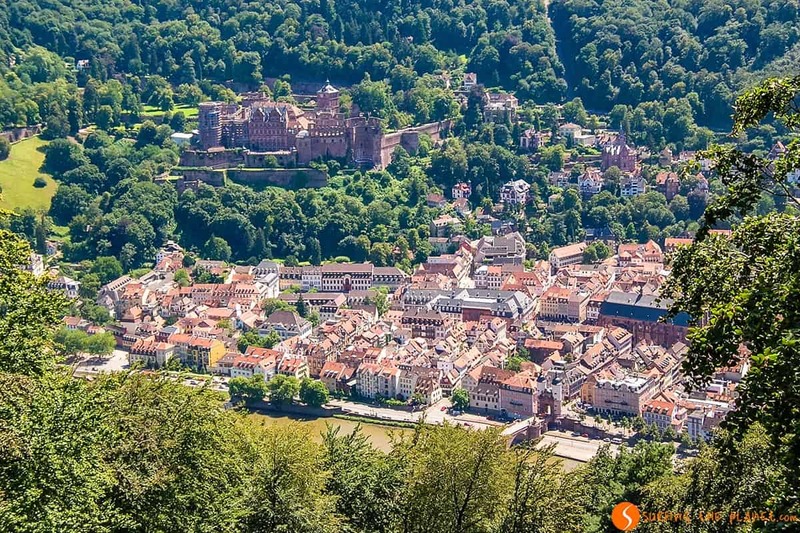 Close to the Monastery, you will find the place where you can enjoy the best views to see in Heidelberg. They are amazing with the Old Town in the foreground and Heidelberg Castle in the background, so we consider it’s worth climbing up here. 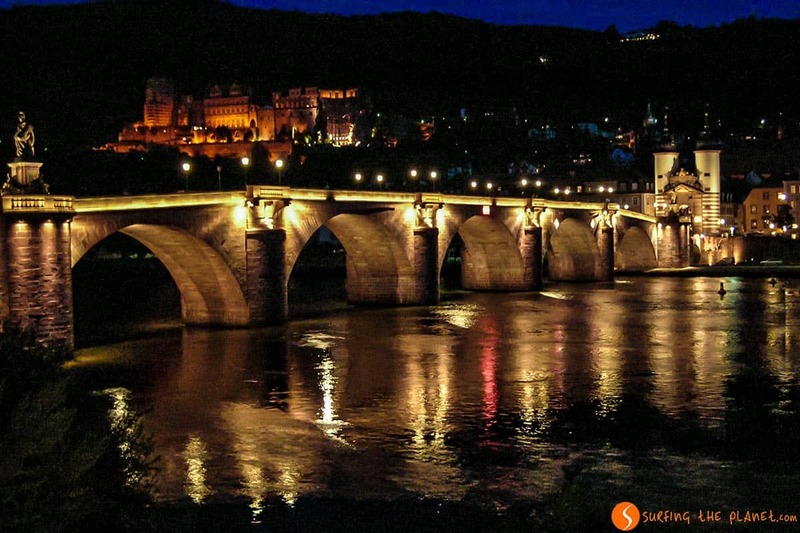 The romantic sentiment transmitted by Heidelberg that you can feel wherever you walk in the Old Town can be felt even more intensely at the night when the lights are on. Both the Old Bridge and Heidelberg Castle are nicely illuminated, and the best view you can get from the river bank opposite to the Old Town. Frankfurt Aiport is the largest in Europe and has low-cost flight connections with many places in Europe. From Frankfurt, you can get on a train, and in 45-60 minutes you get to Heidelberg. From the main train station in Frankfurt, there are direct trains. 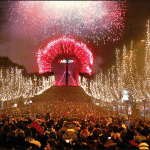 The latter is the option if you want to spend some time in Frankfurt, too. From Frankfurt Airport you can get on a train that will take you to Mannheim and there you can change to another one that takes you to Heidelberg. The total travel time doesn’t exceed 1 hour. It’s not the ideal airport to visit Heidelberg since from Frankfurt Hahn it will take you 2-2.5 hours to get to Heidelberg. Moreover, you will need to take the bus operated by Flixbus, and depending on the traffic, the trip can be even longer than that. – ZZZ… BOOK YOUR HOTEL IN HEIDELBERG – find the best hotel for you. 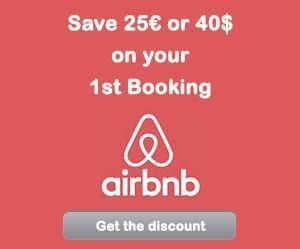 – FLYYY… Find the CHEAPEST FLIGHT TO HEIDELBERG. – BRUM BRUM… RENT A CHEAP CAR FOR YOUR TRIP TO HEIDELBERG – find the best car for you.